Monuments in Hyderabad predominantly date back to the Nizam era. This historic state Assembly building built in Asif Jahi/Indo-Saracenic style, Public Gardens, Mozamjahi market, Begum Bazar, the Salar Jung Museum, the Qutub Shahi Tombs are all mute testimony to the grace of bygone era. Sadly, like all other booming cities, Hyderabad has also seen its heritage structures depleted by indiscriminate construction and gross negligence by authorities. Nevertheless amidst cries for heritage conservation, the city still has some marvelous notified heritage monuments, numbering around 140, some places, some rambling houses, temples, mosques, tombs – all worth preserving. Then there are the modern structures that symbolize the dreams and aspirations of a younger generation. Golconda Fort is definitely India’s most cherished citadel that epitomizes the marvelous blend of ‘Nawabi’ culture and grace of the time. Situated atop what was once called ‘Golla Konada‘ (Shepherd’s Hill), in Telugu, the fort has humble origins in a mud fort built that was built by Kakatiya king in the 13th century. The ruling king had built the fort just about the holy spot where a boy (Shepherd) had discovered an idol. Later on, Golconda fort came under the control of the Bahamani dynasty and thereafter became the capital of the Qutub Shahi dynasty rulers. Subsequent generations fortified Golconda further and now one can see the remains of meticulous architecture including fading gardens fitted with extensive lawns, springs, and fountains. 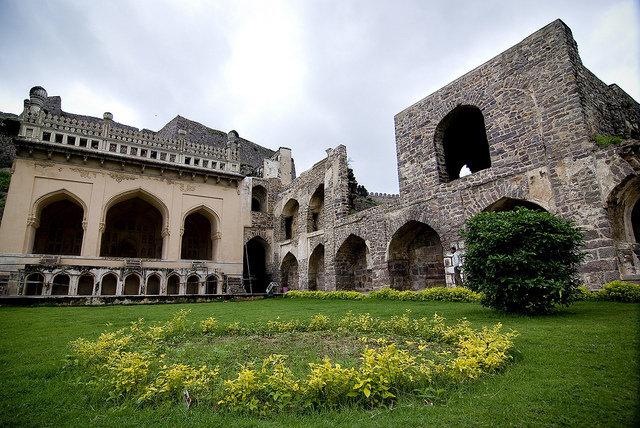 Golconda continues to fascinate visitors with its amazing acoustic system. It is designed in such as way that a hand clap sound made at the Balahisar gate of the fort would be heard on the top of the Khilla. You can have a look at Royal Nagina Gardens (popularly known as the Shaan of Fort), the bodyguard’s base quarters, and the water tank system. They are truly a masterpiece and worth your time spent. When you come outside of the Golconda Killa, you will find 2 pavilions – the Taramati Baradari and the Premamathi Nritya Mandir (well known for the sisters Taramati and Premamati). Actually, they are significant due to their exceptional performance on a two-storied structure called the Kala Mandir. The king used to watch it straight from his court (durbar). The other historic Qutub Shahi Tombs known for Islamic architecture can be found at a short distance from the fort. Hey! I'm not a finished product. I grow and learn every day. Life never stops teaching. Every day is something new to face. As a result, I owe to learn something new every day till the last mile of learning.